It may be argued that creativity is something that's divinely inspired, that a few people have it and some people dont...maybe you are one of the ones who doesn't have it? 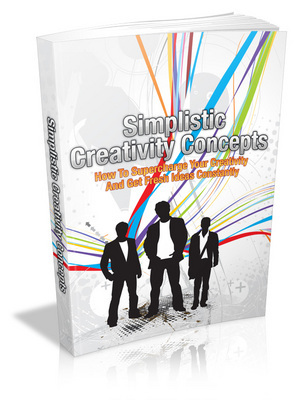 If You Want To Skyrocket Your Success And Improve Your Overall Life...You Need To Have A Look At Simplistic Creativity Concepts! You know why most people have a tendency to not achieve the success they desire in their business and overall life? It's because they don't know they may need to change their approach. If youre sitting in front of the computer trying to write the next Great American Novel but simply cant seem to get a handle on the words, you might find that youre pressing too hard in one direction. Look to other forms of expression to motivate yourself. Attempting to write a song? Rather than listening to music, head out to the local art museum for some visual input. Having trouble with image design? Go to the symphony and let yourself be enlivened by a completely different art form..
* They don't know how about brainstorming. * They also don't understand how to collect ideas. With the strategies that Im about to let you in on , you will have no problems when it comes to supercharging your creativity and get fresh ideas constantly.